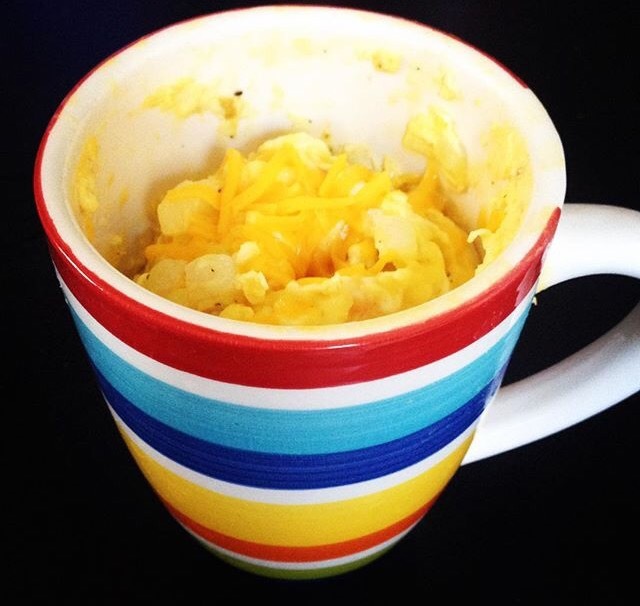 I would usually cook omelet in a pan with canola oil for breakfast.Today, Ron decided to try cook omelet in a mug by microwaving it..
First, crack the eggs into mug, add milk, then beat it with fork until well mixed. Second, chop the onion and sausage then mix it into the mug. You can add green bell peppers or ham.Third, microwave it for 1 minute (time may vary). Finally, add desired toppings. For us, we like shredded cheese because it makes the omelet more delicious! Season it with garlic salt and pepper, if desired. This is the first time we tried making this and it was great! I definitely want it to look better (next time!) but I am really surprised how it stayed hot for about 10-15 minutes. I will make omelet this way starting today! If you are running late in the morning, I say this is perfect for a busy morning!